These are the cookies that I give to people when I want to show them how much I love them! They are easy to make with pantry staples and the crispy crackly crunchy exterior and soft insides make everyone smile! It’s like December all over again around here! Cookies! Yay! This is my third batch of Peanut Butter Crinkles in three weeks. I’m getting to the point where I can make these without the recipe. I love that when that happens! Remember those classic peanut butter cookies, the kind we had as kids….with the little fork criss crosses on them? They were pretty crumbly, and sometimes darn right dry. But these beauties are chewy and crackly and crunchy and perfect. I’m highly descriptive when it comes to my cookies! a bit of additional salt for a sweet salty taste, and baking soda only, no baking powder. It yields a flatter, denser cookie. To make them ‘mo beta’, I roll them in raw granulated sugar. Not just a little sprinkle of sugar on top, but roll the whole cookie dough ball in it. It gets them all crackly crunchy and stuff. Now if you don’t have raw sugar on hand, by all means use regular sugar, but you might miss out a bit on the crunch…but you will still have the crackle and chew! If you like your cookies crackly, crunchy and chewy – try my Molasses Crinkles Cookies! 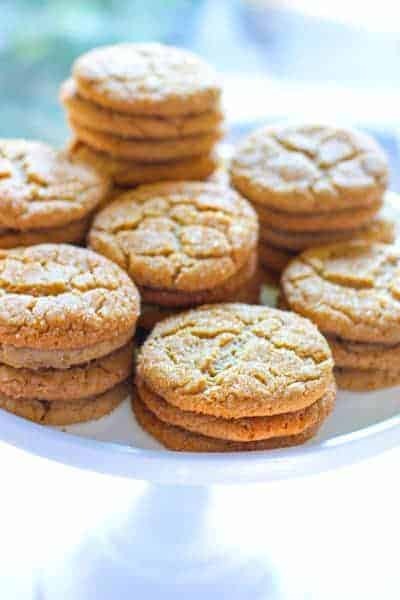 These crunchy on the outside soft on the inside peanut butter cookies will become your family favorite! Prepare baking sheet with parchment, silpat or spray with non-stick spray. Using an electric mixer, combine sugars, butter, egg, peanut butter and vanilla until well combined. Add flour, baking soda and salt to wet ingredients. Mix for about 3-4 minutes scraping down the sides a time or two. Shape teaspoonfuls of dough into round balls. Roll in sugar and place on lined baking sheet. Bake for 13-15 minutes or until slightly firm to the touch and crackly. Cool 5 minutes before removing from baking sheet to cool completely. I double the cookie dough batch and freeze the other half. Wrap in parchment and in a ziploc bag. Thaws out beautifully at room temp. Just made it! It’s in th e crackling! Absolutely delicious. I turned the oven up slightly and used a cookie scooper to make perfect little round shapes. 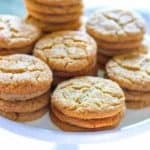 Absolutely delicious and not your ordinary peanut butter cookies! I am so glad you liked them! They are, without a doubt, my most favorite cookie! Thank you for taking the time to send a note!